Recipes and Casual Conversations on Cooking, Baking and Travel. I am a Certified Professional Olive Oil Taster from ONAOO in Italy. I am passionate about cooking with great Extra Virgin Olive Oils from around the world. www.eVirginOliveOils.com. Let's Cook Something! 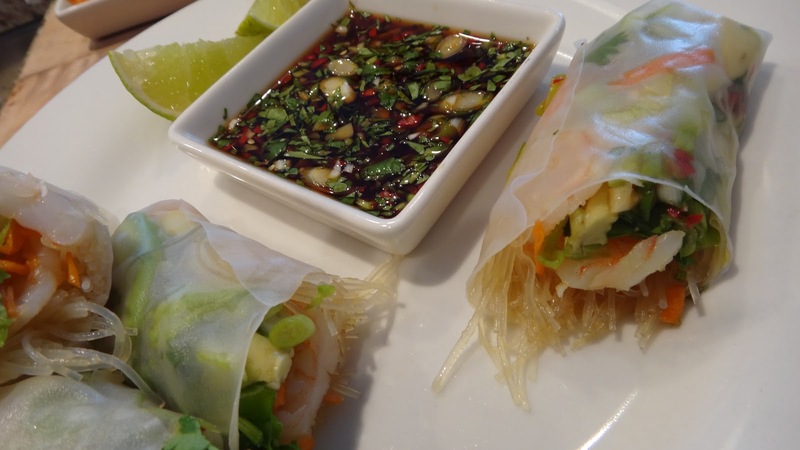 These wraps make the perfect lunch. The fresh crunch of the lettuce and carrot with the contrast of the soft prawn/shrimp and avocado and the spicy sauce make this just the perfect combination to me. In fact, I am ashamed to admit I ate all of them myself!! When Big Pete is travelling on business I like to make things that he would never eat. 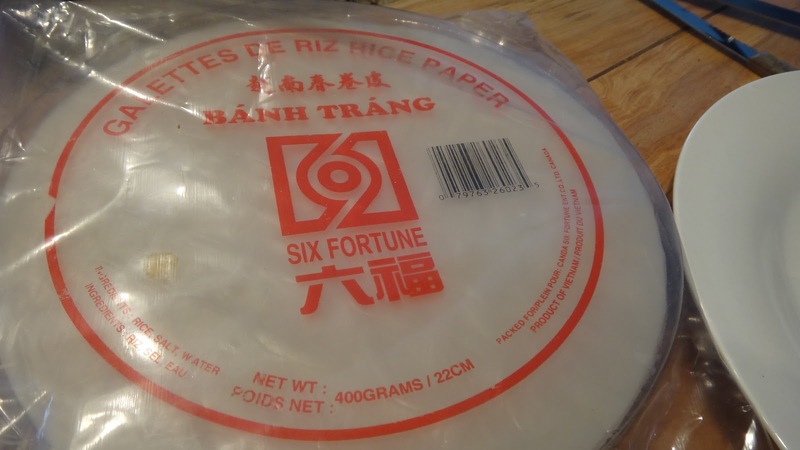 The man can’t get beyond the texture of the rice wrapper but, he just doesn’t get that he is missing out on a truly fantastic meal! 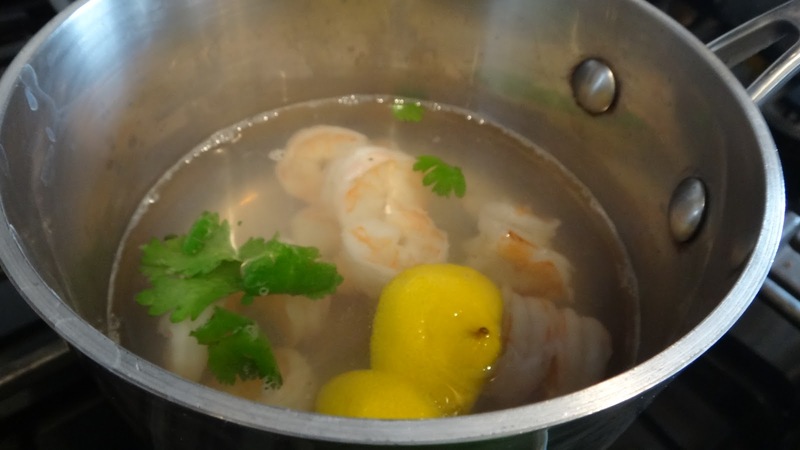 Step 1: in a small pot, boil water and cook peeled and de-veined raw shrimp/prawns. I put a few slices of lemon and a few sprigs of cilantro in the water to flavour. This should only take a few minutes. When the shrimp turn pink let cook for another minute and remove to cool. 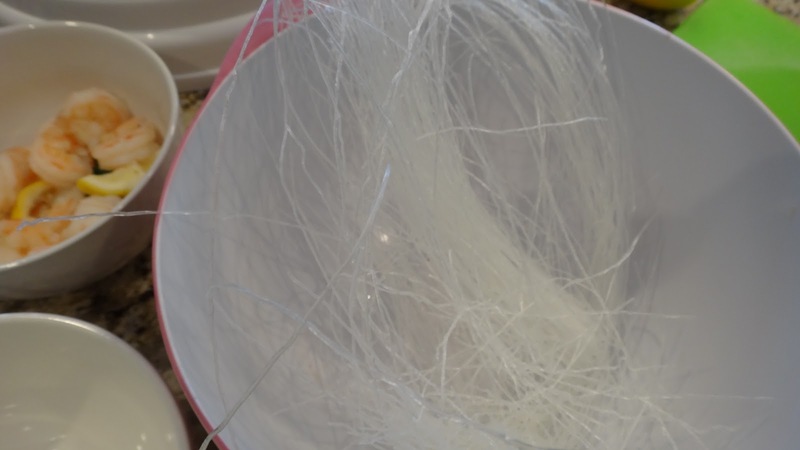 Step 2: place some dry vermicelli noodles in a bowl and pour boiling water over to cover. You may need to carefully push the noodles to submerge. Let soak 3-4 minutes until soft. Drain and set aside. Step 3: prepare sauce. 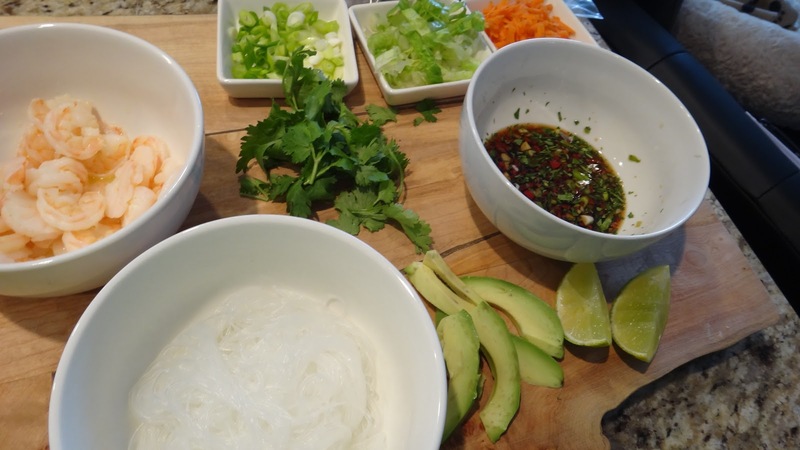 Add all ingredients to a small bowl to combine. Step 4: prepare all your chopped fillings. I like to butterfly the cooked shrimp to create flat pieces of shrimp. Step 6: pour warm water on a plate and add a wrapper. 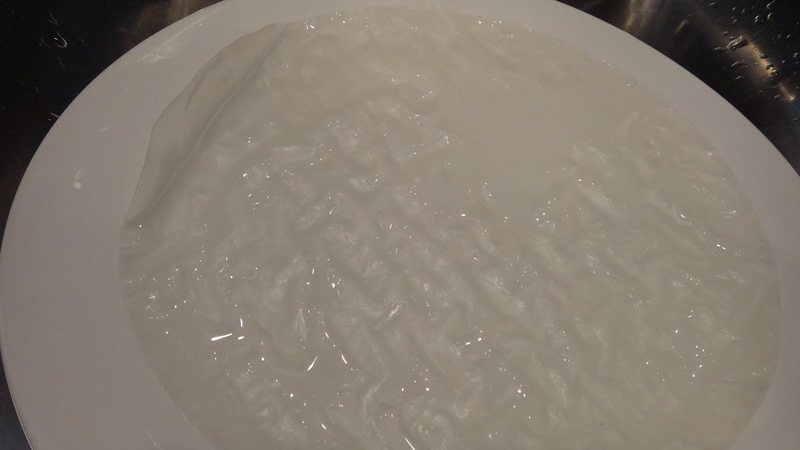 Let soak for a few seconds on one side then flip over to soften completely. 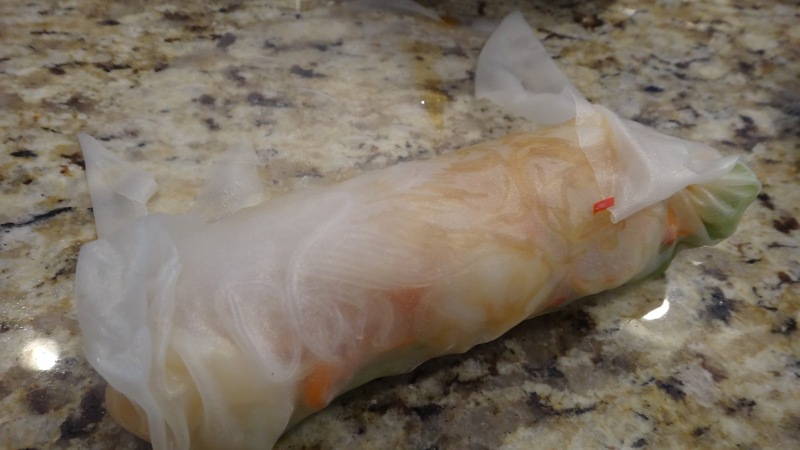 Place on a counter to fill and roll wrap. Careful they are delicate! 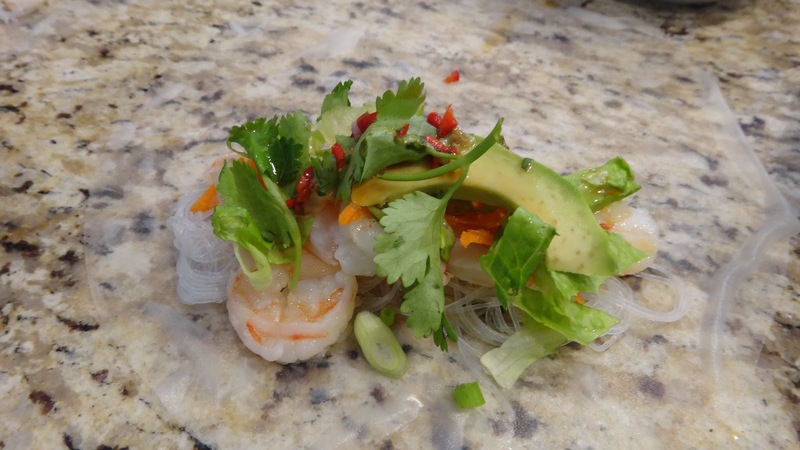 Step 7: divide your shrimp into 4 portions and fill each wrap with vermicelli noodles, shrimp, avocado, cilantro,lettuce, carrots, spring onions and a bit of sauce. Do not over stuff the wrap for best results and do not use too much sauce – you really are looking to take some of the chili and large pieces of sauce with just a few drops of the liquid. If you add to much and make a mess just start with another wrap! You will see how much to add once you do one. Remember understuff and keep all ingredients dry so they will stay together when rolled up. Step 8: start to roll keeping contents tightly inside. When you roll over once then you can fold sides in. Like making an egg roll continue rolling to finish. The damp wrapper will stick to itself. Continue for all four. Slice in half and serve 2 per person. 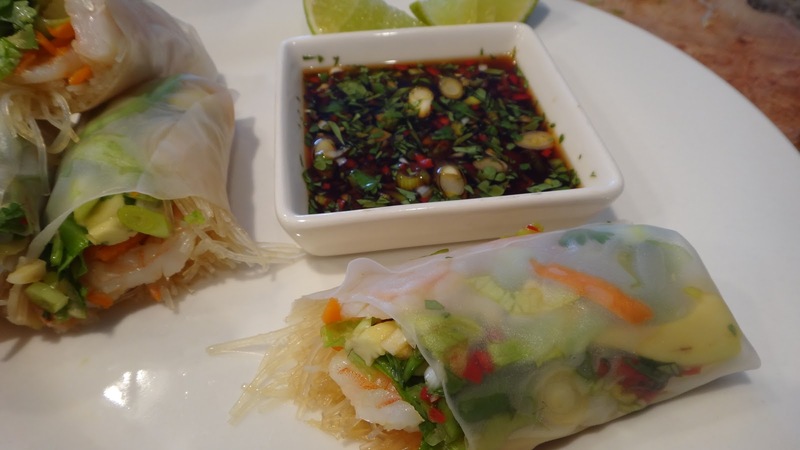 I like to squeeze a bit of lime into sliced wrap and using a spoon pour a bit of the sauce into each half as I am eating it. Absolutely yummy!! I am not a big fan of shrimp but, I must say I was pleasantly surprised at how good these were! 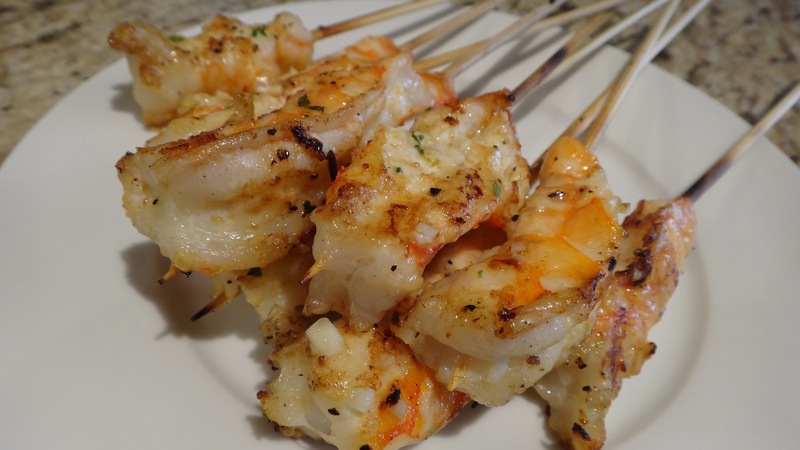 The skewers keep the shrimp from curling up and they literally take 2 minutes to grill. 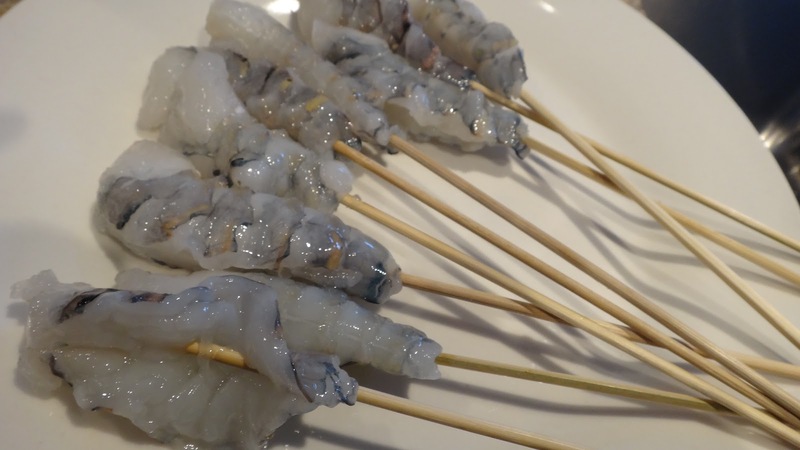 10-15 raw shrimp – large size, peeled and deveined. 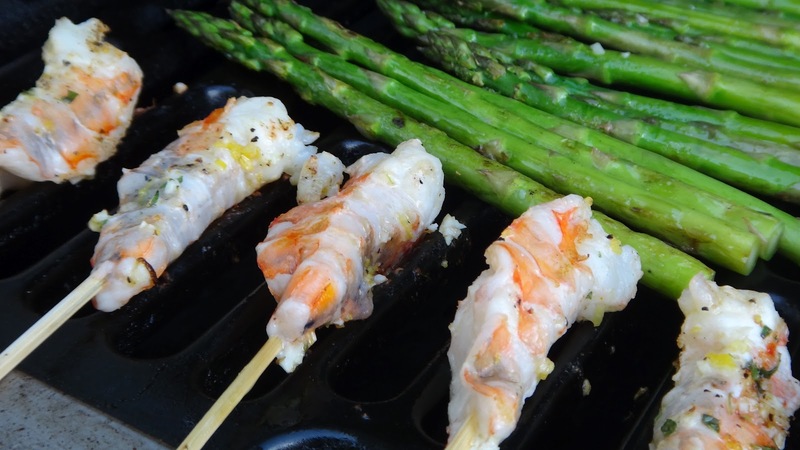 the other half of the lemon can be squeezed over shrimp while grilling. Step 1: I buy frozen raw/uncooked shrimp with the tails on. I thaw them in the fridge and peel and devein them. I then slightly butterfly them by cutting in a bit deeper on the side you devein. 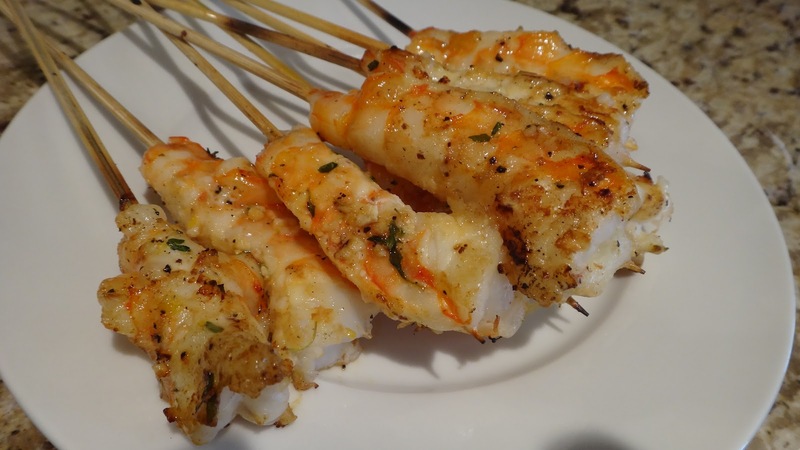 Step 2: I put each shrimp on a bamboo skewer starting at the tail end. This will keep the shrimp from curling up when they cook. Step 3: I place shrimps on a flat surface and sprinkle all ingredients over both sides. I chop the garlic and sprinkle evenly. 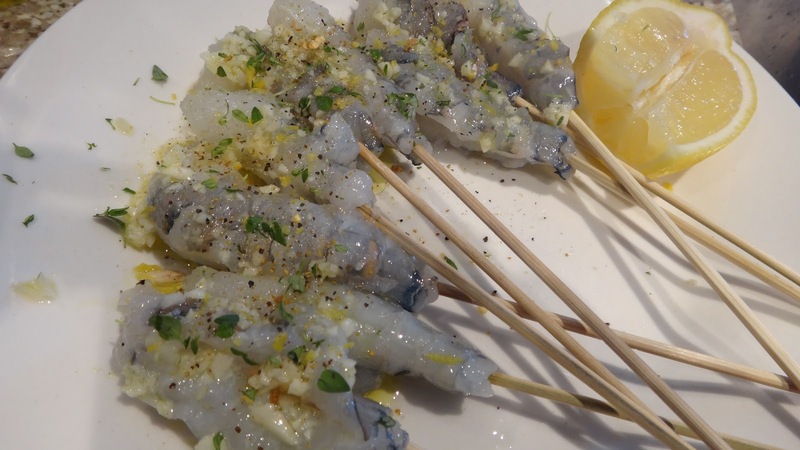 I drizzle the olive oil and sprinkle the chopped lemon zest (or use a zester directly over the shrimp) a generous sprinkle of lemon pepper and the juice from the half of fresh lemon (do not use that fake lemon in a bottle here….anywhere really!) Finally, finish with the fresh thyme. Do this just before you are ready to grill. 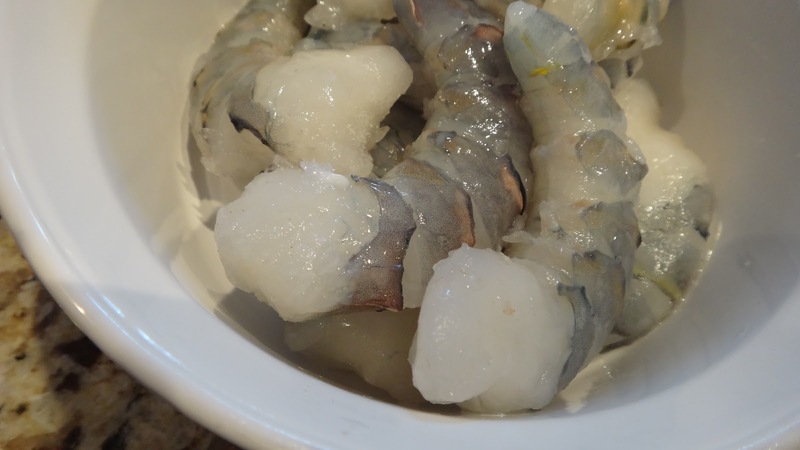 If you leave it longer than a few minutes the lemon juice will start to cook the shrimp. Step 4: cook for a minute or two until they turn pink. I also squeeze the remaining half of the lemon as well as a bit of olive oil to finish. Even Big Pete ate a few of them and he is not a fan of shrimp at all. I made them because “The Dad” was visiting and he loves them! I think I might make them again cause they were really good!